Does it use lists appropriately? Is it appropriately sequential, categorical, chronological, causal, etc.? If it tells a story, does it follow an arc (exposition, rising action, climax, falling action, and denouement)? Some people are probably shifting uncomfortably in their seats right now … If that’s you, bear with us. If you’re as happy as a clam at high tide, then rock on! If you do all of the above proofreading and editing checks, that’s incredible! The truth is: Most people don’t. And that’s okay! Most people will perform the proofreading steps and call it a day. Others will dabble a little in style reviews. For those serious about breaking into the professional publishing scene, they may hire someone to proofread and edit their content. There’s no shame in asking or hiring someone to edit your articles. Often, the writer is too close to their work to see where improvements can be made, they lack the time to perform the review, or editing is just not their strong suit. How much do you edit your articles? Do you have someone proofread your articles? Why or why not? If you answered yes, do you also have them make the necessary changes? Also, is it a friend, family member, colleague, or someone from a professional editing service? If you proofread your own articles, are there any areas you wish you could have a little help? Let us know – we’d love to hear from you! I write posts for my blog on a regular basis and it does not matter how many times I edit my posts, I always find something new to change. I think it is not necessarily a bad habit since it improves my overall writing quality. I edit my articles from scratch always I like to have them in my own tone. It is a matter of building a vocabulary in the process as well as using your vocabulary effectively in expressing yourself. >How much do you edit your articles? It varies depending on the article, I have been quite agressive on editing third party submissions to the point of complete re-writes as they were just nonsense. For my own, often the articles are drafted whilst a project is still being worked on. In that case the article might get revised a couple of times and split into multiple parts if it seems too long. I have been know to correct errors after publishing. I don’t really have a house style or structure guide but I do like to space any available picture throughout the article. I also have a particular style I use for interviews and for code examples. I’ve recently moved to hosting code externally on github as I feel long listings detract from readability. >Do you have someone proofread your articles? Why or why not? I don’t have anyone to do that for me and have no budget to get a 3rd party to do it for me. >If you proofread your own articles, are there any areas you wish you could have a little help? I did experiment with “After the deadline” but found it too arduous to work with. Probably the thing that would be of most help would be a general style/structure review with recommendations for future articles. Why not offer a paid service for EzineArticles editors to edit the users’ articles? How great would that be? Instead of rejecting articles and suspending accounts, they would earn more money for themselves and editors and get more quality content online while providing a valuable and much-needed service. EzineArticles already has a slew of editors anyways. It probably wouldn’t take much longer to edit it than go back and forth with users explaining why it was rejected for one or two words or 2 instances of a keyword phrase or a typo or other simple errors. Good Idea John, It will save hundreds of articles from rejection and our writing will get improved! Sorry I had to make two comments. And These the second, because of the rush. I strongly agree with John. I was someone who had to work hard to continue my goal, to build a website and my blog. So it would be very time consuming if it should improve and learn about grammar. I’m confused, should be to whom and where, I will ask for help to correct or improve my article? If you provide this assistance, I was the first person who will ask for your help, Mrs.. I do everything involving my articles and you can bet I wish I had help in doing so! I proof and edit my own articles. I find it absolutely necessary to print out my draft and review it in hard copy. I can’t imagine catching typos, etc. without that approach. I do use spell check to check my spelling and grammar, however, I also read my copy out loud to myself to make sure that it sounds good. I read it aloud slowly so that I read each word and make sure that I am using it correctly. Do I do all that stuff? Yes, always, because I have the skills; and most of it is done on the fly and double-checked later. Most people don’t, though, and this blog has a lot of help for those people. But do I get help on checking and editing articles? Absolutely, as much as I can find time for. Because “two heads are better than one”! I generally find that my own English and other skills are superior to those of the other people I swap checking with, but so what? We all have our limits, we all make mistakes, and we all get it wrong sometimes. So I rarely let an article out into the big, bad world without at least a second opinion. Even if it’s me a few days after the article is completed. Hope no-one thinks that I sound like a big-head! But it is important to recognize where your own skills lie, and where to call in help. Where you have great skills, recognize them and don’t do the ‘false modesty’ thing we all get taught when we’re kids. But where you’ve found that you get it wrong too often, don’t be afraid to call in, even to hire expertise. I do all my own proofing but time breaks are a must for me. Basic proofreading isn’t difficult but getting the tone correct and the general flow of the articles takes a little more effort. I use time breaks where I re-read for ‘flow’ and find that the break in concentration often reveals some newer and more effective arrangement of words and phrases. Basically this was a good article but I should say that reading many of the EzineArticles available I find proofreading to be the lesser of the evils. Thin content appears to be the main weakness. Unfortunately I find, all to often, a lack of any worthwhile or helpful information and it is this, rather than poor proofreading, that is the main detraction. Provide quality material and I will overlook the proofreading errors! It’s truly a matter of time for me. The more articles I write with a deadline and a third party waiting, the more I see the need to simply hire someone to edit; especially when my deadlines are back to back. When I have the time, and sometimes I do, I edit it myself; but even then, I do not publish until I’ve had at least 2 more sets of eyes look it over, generally family members. I do edit my articles everyday, I proofread them myself. I prefer doing it myself because that’s when I am really satisfied I will publish the actual work I would like my readers to see. I would need some help because i sometimes get guest posts with vocabulary I am not familiar with and this usually teases me. I have to first get to google to research about such vocabulary, yet if i happen to be helped with such, I would spend less time. When I get someone else to edit, I still have the final say. Consequently my readers always see the actual published article I intend for them to see. It would be absolutely insane to any of our articles and/or blog posts. We devote our time to selling equipment and supplies for environmental remediation, not writing and editing content which is why we always higher than outside service (usually seven we find on craigslist) to do this chore for us. That way we know we are covered by a professional. I edit and proofread my own articles. I often handwrite in the early morning and then create a file on the computer. I print the article, let it rest overnight and then read and reread in the early morning. Invariably I find errors and sections that need additional work or redundancies that need trimming or rewriting. I usually do my own editing. Sometimes it’s not perfect though – since I have other marketing chores, and also… a life to live LOL. Those who do edit your own articles though, I commend you. Means you stand by what you write, and that you’re passionate about becoming an expert in your niche. Yes, I always edit my own articles. I normally go through them twice. I could not think of any other way. Yes, I would love to edit articles written by others. If there are writers in Ezine looking for someone to edit their articles, I am at your service. Nice post, and I’m in two minds about how I edit. Sometimes I have a run of amazing thoughts and can type the best ideas out in a short punchy amount of time but it’s often not long enough to be a full article, or at times fragmented, even though it’s a great thought. Then, I struggle a little and sometimes a lot, with getting the whole thing flowing like my thoughts were when I have to shift things around and it can change the context of what I’ve written. I have so many started and unfinished symphonies of the mind I’ve captured in some way in a list of text files, word files and livescribe thoughts. Sometimes I’ll read something out loud and that has helped me get a better tone and message of what I’m trying to say, and sometimes I’ve tried to record what I’m thinking but that takes waffle to a whole new world. And after a while I get discouraged and start thinking who wants to hear what I have to say anyway.. .. but then I find something I want to share and start the cycle all over again and from that, the occasional gem gets to see the light of day. The templates I purchased with the blueprint style of content have definitely helped me structure my thoughts – they are great! I have recently joined EzineArticles and always edit my own articles. English is not my native language so it is not an easy task for me to write the article or even rewrite. But I always try to do, love to write and blogging. Though I do all these, still mistakes creep in which I fail to notice.However,a review by another person lends more support. At times, lack of time and overconfidence land in trouble for the articles submitted.Could you suggest the resources for editing articles ? Mohan, I can relate to what you’re saying. No matter how many times I read over it myself, the chances of me missing something are still pretty high. For that reason, I always get at least two other people to proof it before it’s published. I always edit my articles myself. I can’t imagine how any other person can be asked to edit my pieces for the simple reason everyone is busy with their own commitments and daily work schedules. Besides if you are not able to proof read and check for grammar or other common mistakes in your own write up, you can’t be a writer at all. The ideal way is to forget you are a writer after finishing the piece and step into the shoes of the reader with a magnifying glass to go through line by line to find out mistakes, sub-standard use of words, lack of clarity etc. keenly. This is how I have been proof reading for the last 8 years as freelance writer (Expert Author in Ezine) to turn out more than 8000 pieces. I strongly recommend this modus operandi (hahahah…see the machine has marked the words in red though its a correct usage of a legal jargon meaning “method of operation”). The machine is an idiot in such circumstances. The machine is ALWAYS an idiot! That’s why we must know what the program is doing when we write and edit in, say, Word; then spell- and grammar-check. Nearly all word-processing programs have an attached spell-checker, and the best of them also have a grammar-checker. Almost all of these are based on an old program called Grammatik-5, from long before the Internet, which is so good that now it’s out of patent, everyone copies it. Spell-checkers can almost always be set to your local or chosen language; most can cope with variants like US- and UK- English, though I’d also like to see Australian and Indian spelling, too. Grammatik-5 based grammar-checkers can be set to the associated grammar styles, and handle differences like academic-, technical- and casual-style, often with tuning for personal preferences. So the machine can cope quite well with spelling, text consistency, style and structure when you’ve set it correctly. HOWEVER, the machine is just following basic rules programmed into it by some technical expert. Most languages, but especially English, have far more variants, choices and preferences than any current machine can cope with, so it’s unwise to think that your editing can be done by machine. So as has been pointed out above, a spell-checker simply looks at each word to see if it’s in the word list it has. It OKs the words on the list and highlights those it hasn’t met (it doesn’t say they’re wrong; it just lets you know). That’s why I open a new personal dictionary for every major project I start, so that I can add every correct word that comes up in that book. Though it is annoying that these dictionaries and the personal grammar preferences are then globally set and will apply to everything until they’re reset. I’d much rather that they change with the file so that, for example, when I finish editing some technical texts for British use, I don’t have to reset Word when I switch to a book for the US market. If that’s you – and it always is me – then fine, but then other people must check the checker. Can I suggest that the co-operative approach may be best? Contact another EzineArticles author whose style you like and whose work is competent, and suggest that you help each other. How does that sound? Proofreading is a must, even for a simple email! Those errors can not be taken back once your audience has seen them. 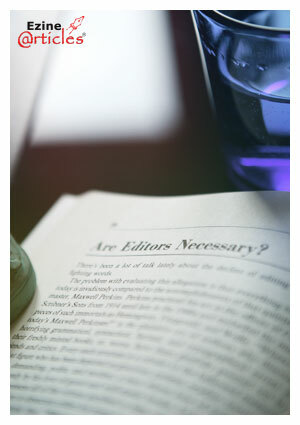 •How much do you edit your articles? I edit at least twice. I go over it once looking for grammatical and formatting errors. Next I go over it to see how I can make it more concise. I may even set it aside for a day and go back to it with a fresh perspective. •Do you have someone proofread your articles? Why or why not? I do all the proofreading myself. If I knew of a trustworthy wordsmith to assist with proofreading, I would certainly consider their help. But I don’t mind doing my own editing. I know my writing best. Wonderful article! For my own stuff – professionally, someone else usually proofs my work as a part of a review process. Otherwise (creatively) I review it myself. However as a proofer/reviewer of other people’s work in my professional arena I am more stringent. It’s always easier to spot errors in someone else’s work than in your own. I totally agree with you. What I do in my office; I and one of my staff alternatively edit the same article so we both get to read and edit the other persons work, while we get to review on our work. Since we do the changes in change tracker, we can see how the other person edited our work. We are currently looking for a proofreader for our office. It is hard to find quality writers. There is little worse than finding an article you have had published riddled with errors, not just spelling, but grammatical, factual, punctuation. The wonderful article you told all your friends to read has now become a vast embarrassment. Sometimes this happens because you were expecting an editor somewhere along the line to make final corrections. As they say in the movies, “trust no one”. The first novel I had published, was given to an esteemed copy editor for corrections. The novel was written mostly in first person, and my intention was to reflect the lack of education of the story-teller by using flawed grammar. The editor did not agree with that and corrected it for grammar and punctuation, and so lost the uneducated voice. I also noticed that the editor never added to the story, just did subtractions. If there was a run-on sentence, the tendency was simply to divide it into two or three sentences, with no thought to the rhythm. If there was a redundancy in a paragraph, the whole paragraph was deleted. This was speed editing, no doubt because the editor was under pressure. I would love someone to check my work, but it is not feasible to use a professional. Turning it over to friends did not work for me; it can ruin friendships. So I use a slow process, reading through what I have written again and again. In one of my longer novels, I went through it 15 times, looking for things to change. That takes a long time (450 pages), but I can say this: each time I corrected it I found errors, but they became less and less. But when do you stop? I usually edit ten times or so. I wait 12 – 48 hours between edits, because the more often I read it, the easier it is to let your eyes and brain skip over things. I just keep going over it and over it until I find that it needs little in the way of serious corrections. But there comes a time when you have to stop and throw your article out to the public. I know that there will never be a time when I will find that there is nothing left to correct or improve, no matter how many re-reads I give it. writing an article is a very tough job as you need to have detailed vision and creativity to do it.Proof Reading of those article should done by expert only as it will provide you an added advantage. Yes, right you have said. I honestly say, I am in order to have been learning to using proper grammar, and are eager to develop a style of my article to the right place. And in the end the conclusion, I need someone who wants to help edit my article, or at least make a correction to my article. Where can I get help it? Whether through EzineArticle.com too? Yes, I do edit my own articles. Because this is a new challenge for me so I am freelance writing at this time. However, I want to submit quality,and focused articles that are appealing and receptive to and by the reader. My reason for not having someone else proof read for me is mostly because of scheduling conflicts at this time. I am aware of the fact that I have a “quirky” borderline appearance of not knowing how to correctly spell certain words; however this is done only (to provoke discussion),and hopefully, not make me appear to be totally oblivious to the correct spelling and command of said words. Now, this just provoked a question for me; Would this this type of thing(purposely incorrectly spelling a word) be considered as “stuffing”? I just learned this from you guys. I am very interested in securing a professional proofreader, and editor for futures articles, and am open to referrals and or suggestions on how to obtain this service. Thank you for this opportunity and challenge. I wait 12 – 48 hours between edits, because the more often I read it, the easier it is to let your eyes and brain skip over things. Yes, I have been the only one proofing my articles as of now. I try to objectively, and fairly proof read in the second or third person however. It is a bit of a challenge as others have stated, and a task that I really prefer to hand over to the experts. That will be my next endeavor for my articles. Love getting all your tips. They always seem to come at the right time as to were I am at in my learning curve. I do all my own editing and really enjoy it because it ends up telling the message I want to share. And because of your informative newsletter I have taken the bold step and write a lot myself. So satisfying. Thank You. Please keep up the great work. As I haven’t published any articles yet, this will be based on my experience writing fiction. Yes, I edit my own stuff. I sometimes have someone read my writing but for content and story rather than editorial purposes. When I’ve finished writing something, I’ll leave it for a few days and come back to it, like clearing my writing palate so to speak. It’s then that I will catch spelling, grammar, syntax, or general errors and also gives me a fresh insight into what I write. With the majority of errors I see everywhere, however, be it online or even in books still, you really see the necessity of an editor (someone online published an article in which they were waiting with “baited” breath). But this is proof-reading, not editing. The editor is concerned in this, of course, but the principal point of an editor is to look at your style, consistency, structure and readability. And this is where editors are so valuable – and so annoying! I always edit my own articles. Through my work in the public sector I have heaps of experience in writing and in editing the writing of others. I have a keen eye and ear for consistency and appropriateness of tone, so proof reading and copy-editing are something I do naturally and automatically. This is, however, something it has taken time to perfect. It’s not simple to edit but not so difficult. Much easy to think what you want and how you want to change. I’ve posted a few EzineArticles that may help people with proofing/editing their own work. Take a look and let me know what you think. Proofreading is an acquired skill. The more you do it, the better you get. In my opinion, it is difficult because you actually have to read each individual word, instead of reading groups of words the way most people read text. When writing novels I will usually perform the first proof read myself. I look for ways to write more believable dialog and smooth, short sentences. I’ll also look for things like double words where a cut and paste might have left one behind. I check for misplaced words such as their instead of there, too instead of two, you get the idea. I scan for errant punctuation like a double period or a quotation mark before a period. At this point, I will send off my file to my wife and a few close friends for story feedback, fact checks and the errors I may have missed. Then I’ll give it another clean up before publishing. The only reason I do not hire a professional is simple. I can not afford the fees at this time. Should my novels ever find their way into enough paying reader’s Kindles, then by all means I will hire a professional editor for every book I write, including those already published. Yes, I do proofread by myself, but still, I’m not confident because I’m in stages of learning English. I still don’t know about English native.